The Stats Room: Does Size Matter at the Goal Line? Last week, we determined wide receivers likely have no predictable red zone "ability." The study was limited to season-to-season and 20-yards-or-less information. I decided to expand the study to include different yards-to-goal and in-season. The results didn't change. To start with, I looked to see if taller wide receivers got targeted more as a team got closer to the goal line, as many fans and analysts consider tall receiversto beend-zone targets. Initially, I found receiver height wasn't a red-zone factor. I expanded the work to move closer and further away from the end zone. Here are the average receiver height and weight for different yards to go. There is just nothing useable in the data. No major difference exists in targeted wide receiver height and weight as a team gets closer to the end zone. Besides the average height, maybe a subset of taller players gets targeted and can catch the ball more. Here are how individual heights matter for targets and completion rates. 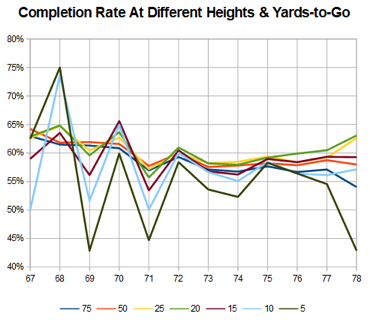 First, here's completion rate chart.